Get this game DRM free and ready to play from GoG.com. Fully working or your money back. You’d think with all the vastness of space, that there would be enough of it to go around. Apparently not though, as the evil and mysterious Shivans have decided they want all of the big empty vacuum for themselves and are prepared to blast all of humanity and their Vasudan allies into tiny pieces of debris. You’re not going to sit idly by and let that happen though, are you? Of course not, so strap into your starfighter and get ready for one of the best space-combat simulators ever to grace the PC. 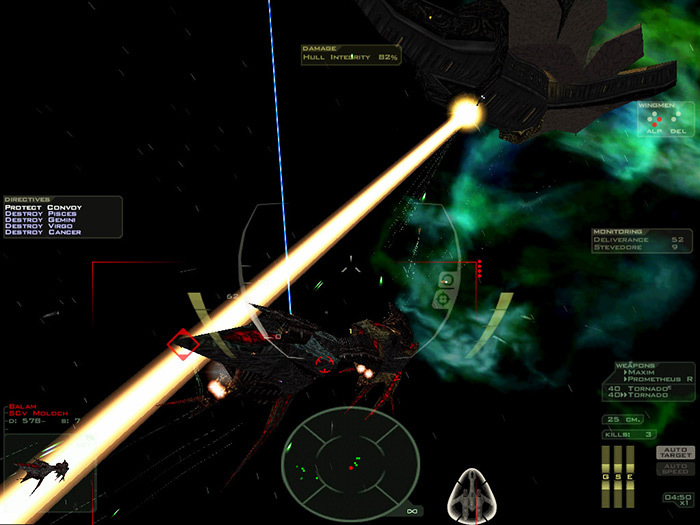 Luckily for us, when Freespace 2 reached the end of its commercial life, Volition software (who’s more recent games include the Saints Row series) released the entire game source code for free, under a non-commercial license. This has allowed a dedicated fan community to continue to update and improve the game, ensuring that it runs just fine on modern hardware. If you’re installing the GoG.com version of the game you should simply be able to double click on the file you downloaded and follow the on-screen prompts. If you are installing from an original retail CD then things can be a little more tricky. Start by putting the first CD into your computers optical drive. Follow the on-screen prompts to install or run the program from your media and the games installer should start. If it does not, browse to the CD in Computer/This PC and run the “Setup.exe” program manually. The installer should then start and run, but it can be a little flaky. The first time we ran it, it got stuck on “preparing the InstallShield Wizard” and then just exited. Luckily, running the installer a second time everything worked correctly. The installer will, by default, install the game to “C:\Games\FreeSpace2”. You can change this if you like, for instance to move the folder onto your D: drive if you only have limited space on your C: drive. What you shouldn’t do however is install the game to the “program files” or “program files (x86)” folders. Avoid installing the game to a folder with a very long path too. Finally, when you install the game, select everything available when asked which components you want to install. 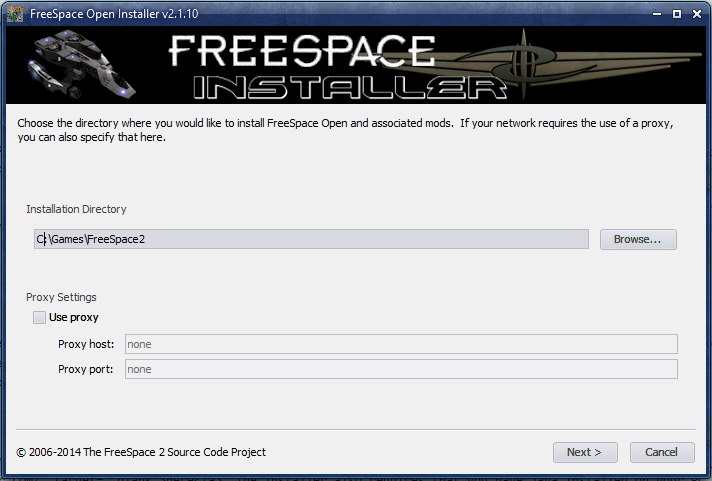 Whichever version of the game you have installed, you should now install the latest version of Freespace Open. 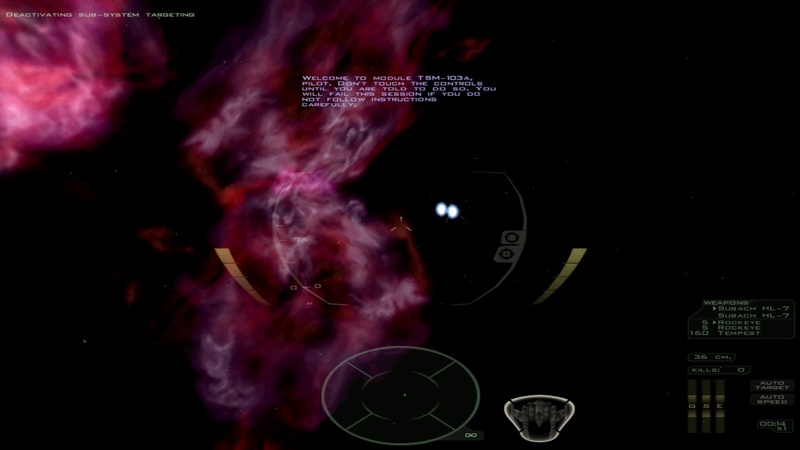 Freespace Open is the fruits of the labour of the Freespace 2 Source Code Project and fully updates the game for modern PCs. 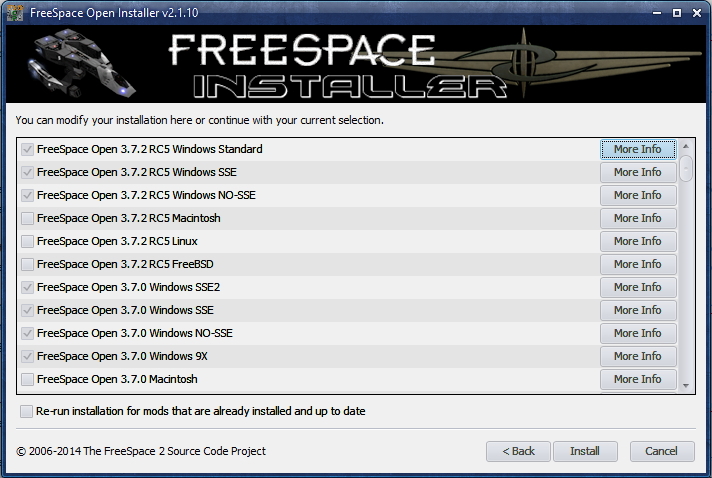 You can install it by using the Freespace Open Installer which you can download here. The installer also requires that you have Java installed on your PC, if you don’t, you can download it here. Once you have Java installed, you can run the Freespace Open installer just by double clicking on it. The following window will then appear. There are a couple of things to note here, first of all the installer may not detect the games folder automatically, so if you changed the default installation directory when you installed the game, be prepared to correct it here. Secondly, the VPN settings relate to the multiplayer components and can be left as the defaults, unless you know for certain that you require a VPN in order to access the internet. Click on “Next >” when you have configured the options and wait a moment for the installer to set things up. The installer will then ask you to choose between “Basic”, “Complete” or “Custom” installation. We’d recommend “Complete”. Before installation, the installer will give you the option to review your choices. No need to change anything here, so just go ahead and click “Install”. The installer will now try to download all the components from the internet and install them for you. Most times this works just fine, but of course things can go wrong. If you get an error message during or after installation, it may be worth simply trying the installer again. The program is intelligent enough to know which components need updating and which don’t. If things still fail, it’s likely that one or more of the sites that host the software that the installer relies on are down. You can either try again later or visit this thread on the Hard Light Productions forums and see if you can manually download the missing file from another mirror. With the game installed and patched with the latest Freespace Open, you need to launch the game using the “Launcher.exe” file that’s now in the FreeSpace 2 installation folder. Do not run the “Freespace2.exe” as that will launch the legacy version which is unlikely to work on modern PCs. Note that the Freespace Open patch/installer does not update your shortcuts, so you will need to manually change the games Start menu/screen shortcut to point to “Launcher.exe” rather than “freespace2.exe”. When you run the launcher, the following window will appear. First of all, we need to choose an executable file. 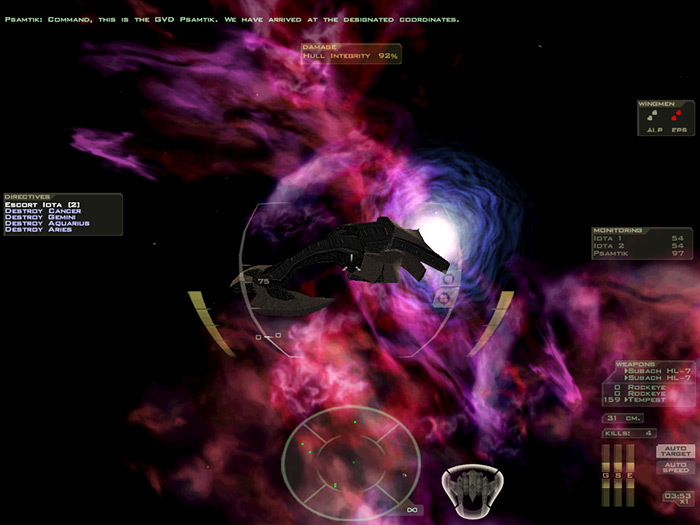 There are several different minor variations of the Freespace 2 open game. Some versions are designed for debugging or troubleshooting, others make use of SSE extensions on modern CPUs. Click on the “Browse” button and choose either “fs2_open_3_7_0.exe” or “fs2_open_3_7_2_RC5.exe”. Avoid any executable labelled “DEBUG” or “WIN9X” (unless of course you actually are running the game on a Windows 98 machine!). The “RC5” part of the second executable stands for “Release Candidate 5”. This denotes that this build is still being tested and could possibly still have bugs. If you’re reading this guide sometime in the future, chances are these version numbers have changed, but the process of choosing the correct file should be the same. With the correct executable selected, we’re almost ready, but before you click “Run”, stop by the “Video” tab first. Make sure that “Resolution” is set to match your monitor or TVs native resolution. 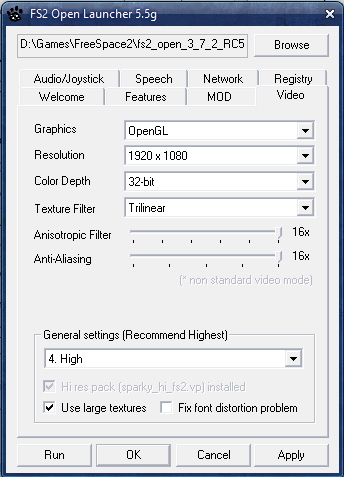 In the screenshot, we’ve selected 1080p or 1920×1080. 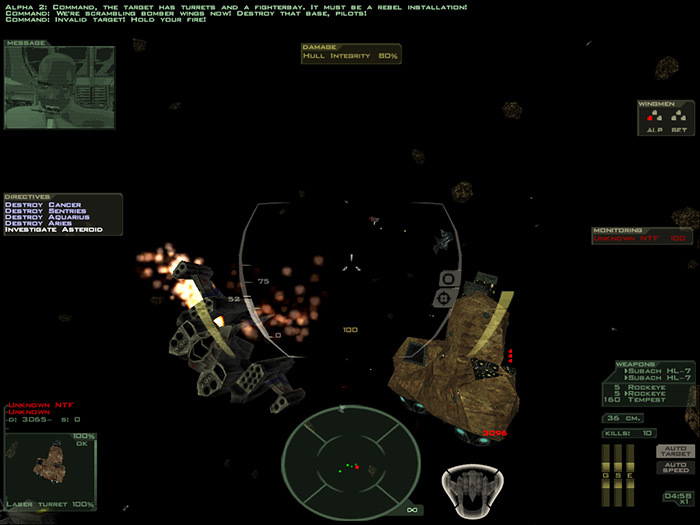 Freespace 2 Open fully supports widescreen screen modes, though you will find certain HUD elements, like the radar, are slightly squashed. See the screenshots at the bottom of the page for an example. All the other visual quality settings can usually be cranked up to the maximum on a modern PC, so just copy the settings we have configured in the screenshot. If your PC is somewhat older you might need to come back here and select some more modest settings, but for most users the full quality settings will be fine. With visual quality options set, we’re now ready to run the game for the first time, so click on “Apply” then “Run”. When you launch the game, after viewing or skipping the intro you will reach the games main menu, which is set out like the bridge of a ship. Click on the officer closest to the bottom of the screen to change the in-game settings. You can click on “Detail” here and make sure that all the in-game detail settings are set to their maximum. you can also configure the games controls. 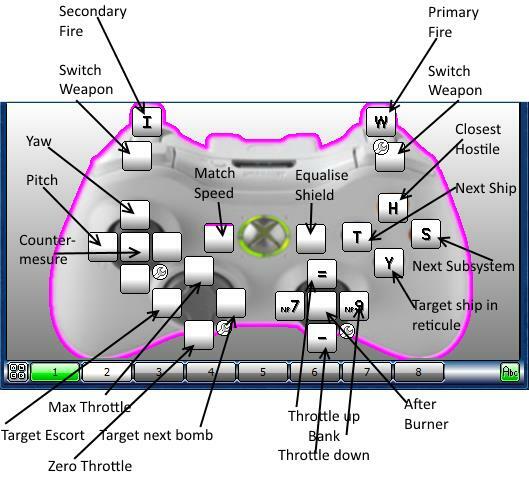 After a little research on the internet, we came up with the following Xpadder configuration. In order for this layout to work, you will need to do two things. First of all, in the games control options, remap I (i) to secondary weapon fire and W to primary weapon fire. Now, wherever there’s a blank button on the Xpadder window above (a button that does not have a key-press assigned to it) you should map that control manually in the game. Obviously you don’t want to map the analogue sticks in Xpadder if you can help it (though for some reason this is the only way we could get the ship to bank, hence the keyboard mapping to the right analogue stick). Mapping the d-pad in the game is better too, since the in-game tutorials will refer to it as “Hat switch”, which is at least a little bit less cryptic than “Button 1” anyway. Learning and remembering all the games controls is pretty complex, but the most important ones are now mapped to the 360 controller. Feel free to print the picture out and use it as a quick reference. If you’re lucky enough to have the original, big box copy of the game you should also have several quick reference sheets. If not, there are some you can print out here and here. We didn’t try out the multiplayer in the game, suffice it to say we didn’t feel our piloting skills were good enough. If you want to give multiplayer a spin, use the “Register to play online” button on the launcher, and follow the instructions on the website that then opens. The awesome gaming utility Evolve now supports Freespace 2, thanks to a custom rule we wrote and submitted. You can now access your web browser, friends list, take screenshots and videos and organise multiplayer matches all without having to exit back to the desktop. “Failed EnumAdapterModes in UpdateAntialiasList” or other issues when running the launcher – This error seems to occur on Windows 8 machines. On our Windows 8 rig we simply ignored it and we were still able to configure all the games options. Some users report having to run the launcher in compatibility mode for Windows XP (Service Pack 3). Alternatively, or if you have other difficulties, you can use this launcher instead. 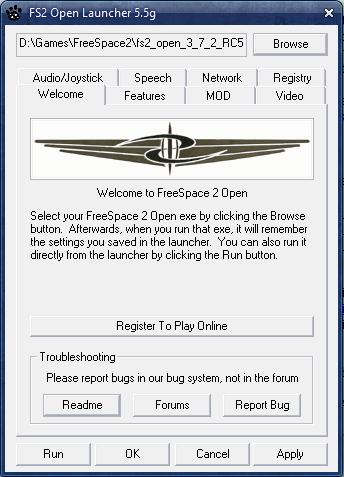 Freespace has detected you only have 0MB of free memory – You’re trying to run the original 1999 version of the game, use the launcher and run one of the “fs2_open” executables. The game in its original aspect ratio. There are some epic space battles in this game. You will never be short of targets. Pretty darn good isn’t it? Also seeing you comment here reminds me, I had Evolve working in Rollcage Redux too, Evolve is like Xfire but way more modern, supports Steam chat too. I just need to polish the rule then submit it. TLDR : with just SCP, you run a more stable version of the game. With the Mediavps, you have updated graphics (beautiful screenshots !). And SCP + Mediavps + original files are all you need to run Freespace 2. If you want a deeper installation and more customization, check the links above. I wish there was a way to edit these comments. Anyway, just found out the FSO installer can install it as well. I just wish there really was an edit ! I tested on Windows 8 and could use the launcher okay, just by ignoring the error message that appeared (see the troubleshooting notes).